NACCHO Voice spoke with Dr. Jiancheng Huang, Director of Public Health, Oswego County (NY) Health Department, about collaboration and community engagement, an innovative program to help expectant mothers quit smoking, and the challenges that keep him awake at night. NACCHO: Please tell us about your professional background and how you got to where you are today. Huang: Having been born in and grown up in a developing country, I am a fortunate survivor of many life-threatening conditions due to life-saving public health measures, which I did not realize until I studied public health. After I finished my medical education, I came to the United States to study public health and received my master’s of science degree. After I obtained my permanent alien resident status in the United States, I started my career in public health—first as an epidemiologist in a state immunization program and later as the director of the program. In July 2012, I was appointed Director of Public Health for Oswego County in New York. NACCHO: What does your typical day entail? Huang: I know every decision has a multi-faceted impact on the county and its residents. I never know what challenges I’ll encounter in the course of a day. I can have meetings scheduled, agendas planned, and things “to-do-listed,” but a disease report, a surveillance result, a rule/code violation, or a media inquiry would deter all I have intended to do. Other than daily operational activities, I promote partnership and collaborations; find channels to reach out and work with isolated communities in rural, remote areas; and enjoy working with educators and students, from higher-education institutions to elementary schools. NACCHO: What is one of your proudest professional accomplishments? 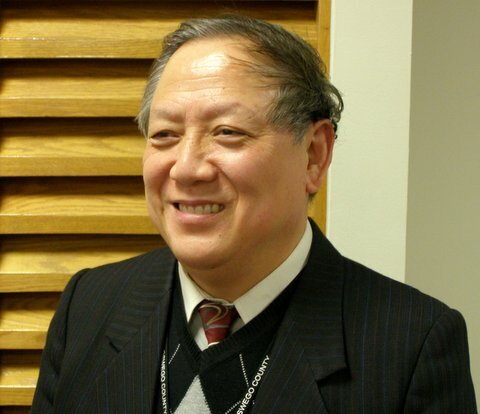 Huang: Before I became the Director of the Oswego County Health Department, I had no personal connections within the county. At first, I found it intimidating to promote public health while I was trying to build the necessary connections needed for successful collaborations. I reached out to health and service entities, the chamber of commerce, churches, schools, libraries, and potential funding agencies in the county. Despite my accent, I was able to engage people through my passion for improving the health of the community. Oswego County has some of the highest rates of adult smoking and of child and adult obesity across all counties in New York State. Smoking and obesity are the two contributing behavioral issues that lowered our ranking to the bottom of the 62 counties in the Health Behaviors list put out by the County Health Rankings and Roadmaps program and brought heavy disease burdens to the residents of the county. Presented with the challenges the community was facing, I gathered together a group of leaders from a variety of organizations. We decided to start with community health behaviors to improve the county’s health status. Without government funding, we worked out a plan, secured grant funds from non-government organizations and non-profits, and launched a program called “Smoke Free for My Baby and Me” in the summer 2014. The program reaches every pregnant woman who seeks prenatal care in the only OB/GYN clinic in the county, identifies and recruits those who want to quit smoking, and provides guidance and incentives to support them. Some women even bring their spouses and partners to the clinic to approach quitting simultaneously. As some of the women will “graduate” from the OB/GYN services, the program is expanding to pediatric and family medicine practices where these women will be continuously supported for their cessation efforts when they bring their babies for well-baby check-ups and routine immunization. A groundswell of enthusiasm is definitely being felt among all partners in the program. The concerns about unhealthy behaviors started to surge and spread in communities. The grassroots effort to improve health status been the first step of a long journey for the county. I am very proud of what we have achieved in a short time since I started not so long ago. NACCHO: What professional challenges keep you awake at night? Huang: Disease outbreaks, emergency preparedness drills, programmatic planning, staff succession plans, and budgeting are constant challenges that often keep me awake at night. NACCHO: What advice would you give someone just starting their career in public health? Huang: Keep learning, take on challenges as opportunities for professional and personal growth, and participate in NACCHO activities. Looking for more insights from local health department leaders? See more interviews here. This entry was posted in interview on April 29, 2015 by nacchovoice.